Truth is it’s not that difficult to know that stuff. Newspapers, radio news, an academic paper sourced on the internet, books, conversations overhead in the streets or in the harbours, and you can put the whole thing together with a pinch of salt. What I spend more time researching is the sort of music I want to include, the types of cars, guns, clothes, restaurants – the incidental details that can fill out a scene. Such as the cow sharks off Pyramid Rock just outside Miller’s Point. Here then are (mostly) YouTube links to the research (posted first on my Facebook page): there’s music (some songs I liked and some I didn’t but included anyhow), the sound of a MP5 kurz firing, car stuff, scenic tours, podcasts, and, yes, cow sharks. Since I started on the krimi venture, I’ve thought that music makes a good sound track to these sorts of novels. With Power Play the spread of music is larger than in the previous books and much of it is not the type of music I would willingly listen to. A few years ago I heard this song by the Icelandic group Sigur Ros. Immediately it felt like the music the main character Krista would jive to. Here is one of their songs. Does it for me. Power Play opens with a restaurant scene. The restaurant’s on Sunset Beach. I went there one evening many years ago and thought it had a knock-out view across Table Bay (the sun was setting) and was just right for the opener to a crime novel. These days the steak and seafood joint is part of a hotel complex. The song they were playing there that night was Neil Diamond singing ‘Sweet Caroline’. A very young Neil Diamond in this YouTube clip. Seemed to me worth having as the opening song in the book. I didn’t read Titus Andronicus in my student days. But about five or six years ago got into it and thought the story could’ve played out on the Cape Flats. To use a phrase it was now and it was happening. Why not adapt and adopt the plot? The names sound like Cape names: Titus, Tamora, Black Aron (Aaron), Lavinia, Baasie (Bassianus), Luc (Lucius), Quint (Quintus). Two years ago the play was staged by the Royal Shakespeare Company at Stratford. I wish I’d seen it. Rumour has it that people in the audience fainted at the famous scene. There are a number of meals and restaurant scenes in Power Play. But if you’ve been to Cape Town and not eaten a Gatsby then there are those who’ll say you haven’t lived. I’ve never eaten a Gatsby and never intend to. But to the converted they are the height of street cuisine. One of the themes that has run through a number of my crime novels concerns Chinese colonisation. Yeah, I know, I’ve had people jumping up and down accusing me of evoking Yellow Peril. So it goes. Thing is that Chinese businessmen and women have been slipping into Africa in various ways for a long while. In South Africa there’s not a small town without its Chinese shop. Their presence is to be found in shopping malls everywhere. This incipient colonisation gets given a spin in Power Play. Here’s a podcast from National Public Radio in the US about the Chinese in Africa. It’s not cool to like the V&A Waterfront but I have to say I do. Nice place to watch the passing parade and just the right spot to set scenes in a crime novel. For Power Play the Cape Grace hotel came in useful as did San Marco restaurant. This clip is cheesy and the music is irritating but you get the picture. Cape Town has become the dominant city in our crime fiction. Not hard to work out why. It is a city of stark contrasts, and it is in this contrast that so much of the city’s crime fiction has located itself. Power Play, like other local crime novels, negotiates the disparate geography of the city. This clip of how kids cope with gang violence dates back to 2013 but, sadly, little has changed since then. There’s a scene in Power Play where some gangsters instigate a shoot-out in the streets of the Cape Flats. As was illustrated on the above video clip that’s an all too frequent occurrence. Shortly before this fictional gunfight, two of the gangsters hear music being played by a local radio station, Voice of the Cape. (Ironically VOC is the acronym. VOC originally standing for the Vereenigde Oostindische Compagnie which established the settlement at the Cape that latter became Cape Town.) Here’s what they could have been playing: Zain Bhikha singing Makkah. One of the challenges in local crime fiction is moving characters around the various parts of the city in order to portray the city as accurately as possible. Here is the other side of Cape Town, the beaches. Adele was on every music station when I was writing Power Play so I decided she would be the music of choice for Tami, Krista’s partner. She was also being listened to by the spooks when they should have been eves-dropping on private conversations. In this clip Adele sings Make me feel your love. And now for the cow sharks. Late in Power Play some of the characters end up in a Zodiac off Miller’s Point in False Bay. While I was writing these scenes my ever resourceful live-in editor asked if I’d heard of the cow sharks at Pyramid Rock? I hadn’t. She came up with this YouTube clip. You know how it is, you hear names and they immediately suggest characters. Two that spring to mind are Hardlife MacDonald and Stones. Both these names belong to real gents, both were instantly co-opted into Power Play. There’s a scene where Stones jives to Beyoncé. His type of music, not mine. Here she sings Crazy in Love. Cars are one of the accessories that take up a lot of decision time. What car best suits a character? 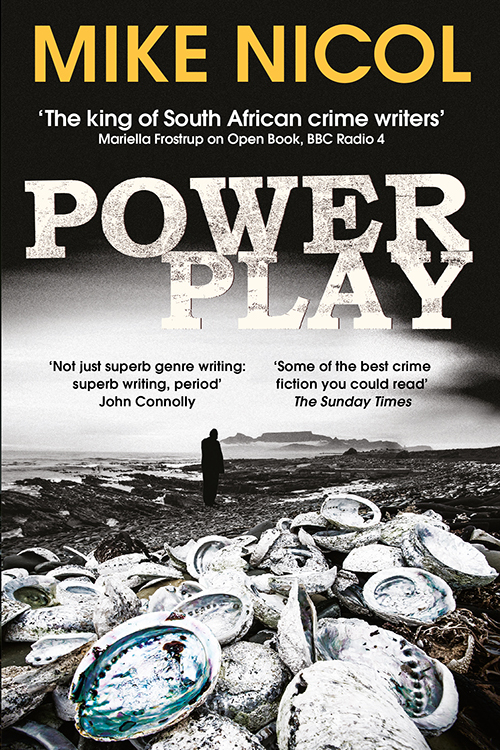 One of the major protagonists in Power Play is a one-time Cape Flats gangster who has made a heap of money and moved into a big house in Lagoon Beach. Question: should he have a zooty recent model or something older? I opted for a late 1980s 300 series Merc. Classy ride. Okay this clip. Stellenbosch crime fiction guru, Jonathan Amid, believes I have a lot of fun writing krimis. He’s on the money. Nothing more engrossing than choosing the hardware, for instance. I used a lot of guns in Power Play. An ancient Astra 400, a Beretta, the ankle-holstered Kel-Tec, a Caracal F, an S&W .38 Special, but most impressive was the H&K MP5, the kurz, which the two jokers in the pack, Black Aron and his sidekick the Russian hitman, buy from a Jewish arms dealer in Sea Point. Have to admit it took a while to decide on that one. But this clip convinced me. Here’s what it sounds like. One of the characters in Power Play is a spook called Mkhulu Gumede. His CV reveals him as a silent killer but I didn’t want to leave it there. Why not have him sing in a choir, I thought? Just so happens that a group of men called the Quarrymen Male Voice Choir hang out in my part of the world and take their name from the nearby quarry. Click over to the soundcloud to listen to them singing Shosholoza. I really hate Frank Sinatra’s singing, and I really loath this song, ‘My Way’. The moment I walk into a shop that plays background music, they immediately flip to a Sinatra song. Sure this sounds like the paranoia of a conspiracy theorist, but, I tell you, it’s true. Despite my antipathy towards Sinatra, it seemed right to let Frankie-baby have some song time in Power Play. Given what the character Titus was planning while he was listening to Ol Blue Eyes, ‘My Way.